Good morning to all the good folk of Young, listening through 2LF. Welcome to my intermittently avid blog. There’s not much on here this week, and thanks to work commitments, there might not be much new content on here for a couple days. My “plan” to write at least something of substance once per day failed quite miserably this week, so I’m aiming to start afresh on Sunday, when I won’t be tired from being forced to sit through bits of overseas weddings between bits of domestic football. I’ll see if I can find the time to sneak in some interesting comments before then…but regardless, you can look forward to a full week-in-review on Sunday. Thanks to Rob Harrington for inviting me on to 2LF this morning. I wish the good people of Young a lovely weekend. West Coast will be too good over in the west. They’ll beat Melbourne with ease. The rest of my tips will follow in the morning, after work. It’s been a while, so I think it’s time once again to delve in to the “I’m not a complete musical luddite, I do like some modern music but I have to really like it for it to appear on these pages” file…and this week’s award goes Martin Solveig and Dragonette, with the feature song being one which I absolutely love, Boys & Girls. The video is rather interesting as well…it reminds me a bit of some of the music videos from the 1980s with the dance sequences which look rather amusing these days, but in a charming way. Also, the male dancer who is at the front of the group on the left of the shot behind Dragonette at 2:22, then behind Martin and Dragonette and eventually moves behind the manikin at the front left of view…he is the spitting image of someone I work with, especially when he pulls his “looking down slightly with a serious expression” face. I’m gonna make it clear, parlez-vous français? (I could be your boy) Come on, rock my world. I hope that the Easter Bunny was good to you overnight and left you with plenty of Easter Eggs. I also hope that if you are celebrating Easter for religious purposes, that it is a most wonderful time for you. Now, some tips for today. Is this the single most politically incorrect thing I have ever written? 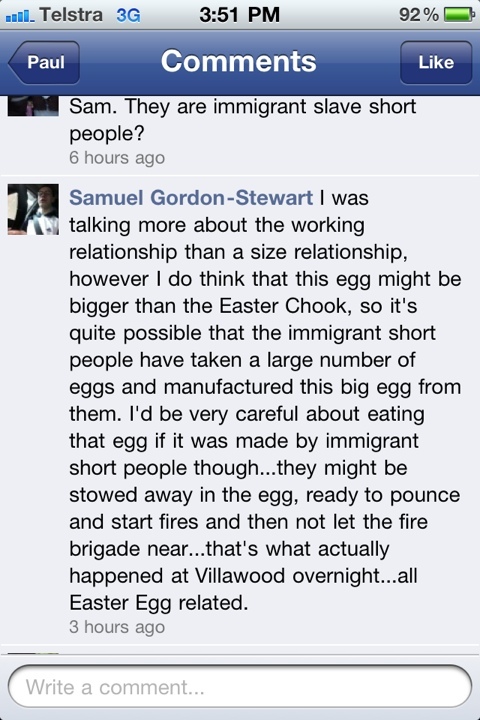 This was written in reference to a giant Easter egg which took up an entire chair. This was after I wrote “the Easter chicken is to the Easter bunny what the elves are to Santa”. As I don’t have time to run through my whole set of tips for the weekend right now, I’ll just provide my tip for tonight, and do the rest after I get home from work. About that security scanner, you’d think that it would have a light on it to indicate that it has power and is working. The fact that the problem went undetected until some armed police walked through it astounds me, and makes me concerned about how many other times this may have happened and gone undetected. As for company profits, they belong to the owners of the company. I’m sure the unions want more pay for their employees and think the profits should be “shared” more; I’d expect nothing less from the socialist unions, but what they forget is that businesses are in business to make money for their owners, and employ people in an effort to achieve this aim. Businesses do not exist for the sole purpose of employing people. In the case of companies, many of us benefit from the profits through our super funds and other investments. And finally, in many shift work jobs (mine included) there are penalty rates or other extras for working certain hours or public holidays. I’m looking forward to working on the upcoming public holidays because of the extra cash I receive. If people don’t like shift work, they shouldn’t take jobs which require it. As Padders notes on his site, The Right Aussie, National Party Senator Barnaby Joyce is considering running against on-the-nose independent MP Tony Windsor in the seat of New England at the next election. This is good news for the people of New England who have been betrayed by the Carbon Tax supporting Tony Windsor, and good news for the rest of the country in that Barnaby could have an even bigger influence on the state of the government by being in the House of Reps. The way I see it, this is a three step plan for Barnaby. 1. Win a seat in the lower house. 2. Become leader of the Nationals. 3. Raise the National Party’s profile to the point where he becomes Prime Minister instead of the leader of the Liberal Party. Don’t get me wrong, Tony Abbott has my full support to continue leading the coalition and to be our next Prime Minister, however I think Barnaby would be a better option if the opportunity presents itself as Barnaby has the gift of being able to be direct; the ability to say exactly what is on his mind without worrying about turning it in to political speak, and to be interesting and charismatic at the same time. Barnaby is arguably more liked by voters of all persuasions than Tony Abbott…this is different to the silly Tony Abbott V Malcolm Turnbull contest which the media keep mentioning where Malcolm’s support comes mostly from staunch Labor voters who won’t vote for him because he’s not in the Labor Party. Unlike Malcolm, Barnaby does not alienate the conservative voters, and so would be likely to attract a similar cross-section as John Howard did. The way I see it, Barnaby would be likely to attract more voters than Tony, maybe even more than John Howard did. That said, it would take a monumental shift in numbers from the Liberal Party to the National Party for this to occur, and Tony Abbott is a perfectly good candidate…he’s just not as vocally eloquent as Barnaby. Intellectually and administratively, Tony is great, it’s just a pity that his personal approval rating is so low because it doesn’t deserve to be, and I think a lot of it comes his speech pattern which sadly leads some people to think that he’s not as smart as he is, and then leads them to believe the slander peddled by some bits of the media about him. This can all be cured by a term as Prime Minister…once people have the opportunity to see him for who he really is, based on his performance as PM, their attitudes will change…but I’m not convinced that he will ever carry as much support as Barnaby can. Put them both together though, and you have a formidable ticket. If we can arrange a Tony and Barnaby combination for Prime Minister and Deputy Prime Minister, with Andrew Robb as Treasurer, then I think we’ll have a country which is in the best hands it has been in for many many years. It would also be a combination which would be virtually unbeatable, especially up against the current government. Incidentally, I touched on these topics in an SMS which I sent to 2UE’s Mike Jeffreys (whose voice was failing him) overnight. For some reason they were asking for suggestions (I think it was a caller’s idea) for animal mascots for politicians. Morning Mike, I’d vote for Barnaby Joyce. He should be PM. As for political mascots, how about the lyrebird. I see Julia in feathers. Get well soon. Samuel CBR. Now that I think about it, we need to find a portfolio for Senator Brett Mason as well. I get the impression that Brett could oversee almost any portfolio with wisdom and incredible competence. He is a great talent. This all makes me long for the next federal election. It really does.